First team All-American Sihwan Kim, soon to be sophomore at Stanford University, shoots 69-71-70-72 to finish tied for 24th at the 47th Northeast Amateur played in Rhode Island at the Wannamoisett C.C. All scores can be found at http://www.rigatpp.org/results/results.aspx?ID=11. Stanford golfers will be busy playing in top amateur tournaments across the country this summer. In the upcoming North South Amateur played at Pinehurst Dodge Kemmer and Steve Ziegler will be joined by incoming freshman David Chung. Check back for results when the tournament ends July 6th. Photo by Julie Ryder of Stanford University. Stanford sophomore Jordan Cox had a unique experience in preparing for the upcoming US Open at Torrey Pines. He played 9 holes with Tiger Woods and Bubba Watson. As reported by AP sportwriter Bernie Wilson, "The 20-year-old Cox said his round was "Surreal. Kind of everything I've dreamed of, everything I thought it would be. It's pretty cool, you know, everybody following us around, the clapping. It was a little nerve-racking at the beginning. You just get used to it and just go about your business."" These are 3 of the 73 AP photos that can be found in the above article. Stanford freshman Sihwan Kim capped off a remarkable first season by being named a First Team All-American by the Golf Coach's Association of America. Sihwan is only the 2nd Stanford freshman to be named to the First Team joining Tiger Woods after his 1995 season on the Farm. Senior Rob Grube became only the 2nd Stanford golfer to be named a four-time All-American by being named a Third Team All-American this season. Rob was named honorable mention All-American in 2005, Third Team in 2006 and Second Team All-American in 2007. Joel Kribel was the only other four-time All-American from Stanford. Sophomore Jordan Cox is headed for the US Open to be played at Torrey Pines, CA after his 70-71 rounds at Lake Merced CC in Daly City, CA. Fresh off of competing in the NCAA championships where Stanford finished in 2nd place, Cox joins the world's best players for what will surely be an exciting event in his young golfing life. As reported in the SF Chronicle by Ron Kroichick, "Cox, the Stanford player, advanced to his inaugural Open after a frenetic week. He helped the Cardinal finish second in the NCAA Championship over the weekend in Indiana, but the team's flight home Saturday was canceled because of a nearby tornado. Cox and his teammates finally returned to the Bay Area on Sunday. 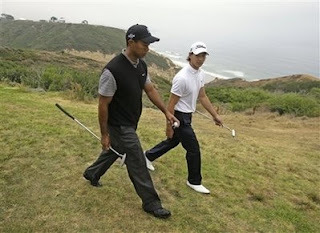 He skipped a planned practice round at Lake Merced to get some rest, then shot 70-71 to earn a trip to Torrey Pines. "It's pretty exhilarating," Cox said." Failing to qualify at Lake Merced were Zack Miller shooting 74-71 (missed by 4 shots) and Joel Kribel with 76-74. 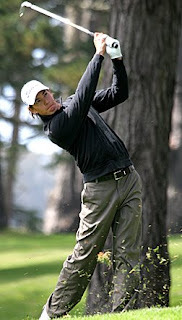 Here you can view all scores at Lake Merced CC in Daly City, CA -- http://usga.usopen.com/qualifying/daly_city.html. Playing in Lake Forest Illinois Rob Grube shot 70-75 to also miss by 4 shots, while Brad Lanning also missed when he shot 80-79 in a tough Columbus, Ohio qualifier. Congratulations to Jordan for his success! Most observers probably counted out this young Stanford team coming into the NCAA finals played in W. Lafayette, Indiana, on the campus of Purdue University. And for good reason. Having finished 5th in the Pac-10 championships and 6th in the West Regional, Stanford lacked experience coming into the championship event. Their only victory came in Hawaii in February. Only one player, soon-to-be 4-time All-American senior Rob Grube, played on the 2007 national championship team. Gone were 3 All-Americans, including last year’s freshman sensation Joseph Bramlett who suffered a season ending wrist injury and missed the last 7 events of 2008. Besides Rob Grube, Stanford’s team included junior Dodge Kemmer, sophomore Jordan Cox and two freshman Sihwan Kim and Steve Ziegler. Last year’s championship team member, junior Daniel Lim, made solid contributions this season but just missed joining his teammates for the final event. The tournament was played on a tough Pete Dye venue that stretched to more than 7,400 yards and featured a brutal finishing group of holes. Mother nature served up high winds for three rounds leading to the highest scoring of any NCAA final in memory. Despite only the top 15 teams playing on the 4th and final round the average score was 78.31. Round 1 – the first day score of 309 had Stanford 12 shots back of the leaders, eventual winner UCLA and USC. Low man was Ziegler shooting a 76. Stanford stood in 12th place. Few expected what would come next. Round 2 – Stanford charged back into the hunt shooting an even-par 288, the tournament’s lowest round, and 9 shots better than any of winner UCLA’s rounds. Grube led the way with a brilliant 69, followed by Cox’s 71, Kim’s 72 and Kemmer’s 76. Stanford moved to within 8 strokes of Clemson. Round 3 – Stanford again outplayed the leaders with the day’s 2nd best score of 296 to move up to 4th place within 5 shots of UCLA. Steady play from the entire team including Grube’s 73, 74s from both Kim and Kemmer, a 75 from Cox and 79 from Ziegler. The momentum seemed to now be on Stanford’s side with the tournament’s best scoring in round’s 2 and 3 by 6 shots. Round 4 – Playing in the next to last group, Stanford doggedly fought throughout the final day to get into the clubhouse with a low score for the leaders to try to beat. On the outgoing nine, the two freshmen showed their grit as Kim eagled the par 4 9th hole to shoot 34 while Ziegler fired two birdies to offset a double at 5 and shot 36. Grube also was steady with just one bogey and one birdie for his even par 36. The challenging back nine lay ahead – a nine that had destroyed many rounds all week. The back nine star for Stanford was junior Dodge Kemmer who after going out in 40 and bogeying holes 10 and 11 stood at 6 over and was thought to be headed for a throw-out score (only the low 4 each day counted). But what a remarkable finish over the toughest stretch of holes with the tournament pressure at its maximum. Kemmer birdied the 12th, 15th, 16th and 18th to offset a bogey on the par 3 17th to shoot 35 on the back nine. Nobody in the tournament would have as good a closing stretch. Kim played solidly over the back nine as well, shooting a 1-over 37, which when combined with his brilliant 34 front nine resulted in a 71, the day’s only sub-par round. His last 3 tournament rounds were the best in the field and he finished in a tie for 4th place overall to lead Stanford’s effort. When combined with the scores of Stanford’s other players the team again shot the tournament’s lowest final round score of 302 and as the leader in the clubhouse would now wait more than an hour to see whether it’s team score would hold up to give Stanford the victory. The 3 leading teams playing in the final group now faced the difficult finishing holes and each completed hole showed their team scores rising bringing Stanford closer and closer to the lead. On hole #17 UCLA’s #1 player (and eventual individual champion), Kevin Chappell, hit his tee shot into the water on the par 3 and took a drop some 180 yards from the green. He punched out into deep greenside rough, now lying 3. A likely double bogey 5 would put Stanford into a tie for the lead. But a remarkable chip-in saved a bogey leaving Stanford still 1-behind. Chappell finished like a champion with a solid par on the 18th and Stanford was left in 2nd place, losing by only one shot. Stanford’s final 9-holes says a lot about the character of this team. Stanford played these holes 4 shots better than USC and 6 shots better than UCLA. Stanford’s young team had played brilliantly over the final 3 rounds to nearly pull out a repeat victory. There is no doubt to this observer that the coming of age of this young team was in large part due to the leadership throughout the year of senior captain Rob Grube. His young teammates kept improving and in the end Grube should be proud of his role as captain in helping to build another great team in the Stanford tradition of excellence. Grube will surely be missed but he has passed on the mantle to a team that is destined for greatness next year with the return of All-American Joseph Bramlett and the addition of a top recruiting class. Hats off to coach Conrad Ray for developing his young team into the season-ending powerhouse it became. He showed great patience in steadily building confidence throughout the year. The experts may not have thought Stanford could be a factor in the national championship, but those of us who know Conrad Ray are not surprised. He is a remarkable person who provides a winning spirit to all he comes in contact with. We look forward to more greatness in the years ahead. The Cardinal team showed its character and had come of age. Congratulations to our 2008 Stanford Cardinal team! Photos courtesy of David Gonzalez, Stanford University. In order of appearance are Steve Ziegler, Rob Grube, Conrad Ray and Jordan Cox, Dodge Kemmer & Sihwan Kim.